There has been a gap of some (gulp) twenty years since I was an active garden railroader and now that I have time and energy to return, I have noticed changes which leave me puzzled. First of all, I presume the hobby is shrinking and evidence this by the changes in publication frequency of Garden Railways and lack of products. For example, I want to buy a K-27 (1:20) but they are largely unavailable new or old and the odd model I do see sells for Fort Knox money. As for rolling stock, I see them only on eBay and they, too, at eye-watering prices. This contradictorily tells me there is a shortage and a market out there. So, I rang Bachmann USA and asked if they were going to build any more K-27s and the nice person on the other end said: 'What would we do that for?' and did not want to answer any of the questions above. What is going on, if anything? Check out Piko USA and Hartland. Piko G scale trains are manufactured in Germany while Hartland is located in the Good Old USA in LaPorte Indiana. Both offer high quality large scale trains at affordable prices. Piko's 2-6-0 with sound is a honey of a model as is Hartland's Mighty Mack switcher. I got lucky and found a LGB Denver & Rio Grande Western combine here in Germany at a Red Cross Thrift Store recently for 60 Euros (around $55.00). Both it and the box were new! I hope we will see an entirely new Garden Railways web site emerge in 2019. It appears that shifting magazine publication from bi-monthly to quarterly is marketing stragedy that reflects the current trend of large scale model railroading that's probably based on supply and demand. In my opinion, when prices are compared, large scale trains offer much more for what a person receives than any of the smaller scale models from Z to O. I considered O and S but despite the small space my basement room affords, I've decided a basic oval will provide me with the enjoyment I want from operating trains than a "larger" layout will in any of the smaller scales. I can already visualize a short freight pulled by the LGB D&RGW '50 side rod, Hartland Mack switcher, or Piko GE 25 tonner. In addition, the Piko enginehouse reminds me of the Revell HO scale structure that was offered in the 50s. Just like the Revell model, Piko's also features the "automatic" (pressurized) door opening function! No, I won't operate long trains, but since I'm making plans on passing Milepost 73 in 2019, I want to be able to see them running without the aid of a pair of super sonic eye glasses! Believe me, I'll still be having as much pleasure as the guys who operate "mile long" unit trains in any of the smaller scales. To quote the famous Model Railroader slogan: Model Railroading is FUN. You bet, it still is! I love your optimism! As a recent returnee to railroading (20+ year break to do Navy stuff), it is nice to have the perspective of someone who has been there and done that! I left the hobby as it seemed to peak in the early '90-s. Even though some of the brands are gone in terms of finished products, I was shocked when I returned to model trains a few years ago how many detail parts shops exist to help transform what is available into something unique. Maybe I was simply unaware of them before, but, oh, well. Bottom line, Castor, in the words of the late Tom Trigg: "Get outside, and get dirty!" Living in an apartment w/o a garden presents a problem if I wanna get outdoors and get dirty. I have a compact basement room which will just have to do. I visited Eisenbahn Dörfler in Nuremberg here in Germany today and found some used LGB track at a nice price which, when cleaned up, will help save me $$$ that I otherwise couldn't afford on my "RFI". Translates to Retired Fixed Income. Though my heart remains in tinplate O gauge, Large Scale best fits my needs and besides, you can always find pre-owned, even new trains, at close out prices that remain within one's restricted budget range. I would be amazed if there was not a nearby "Gartenverein" that wouldn't do backflips to have you set up a "Kleinspuerrbahn" in their premises. Given Nuernberg is the home of LGB, I would be shocked if a "Gartenbahnverein" does not already exist! Well, Herr Trinity, Eric is right. You are at the innenstadt of all things LGB, but it depends on what you are modelling. 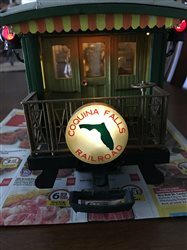 I fear they have deserted the Fn3 crowd who were focusing on Colorado narrow gauge (see my original above) and so I spend far too much time crusing eBay, etc., for relics of the 1990s. So if you run into the LGB people at the bratwurst stall, tell them to make a D&RGW K-27 and I will buy two of them! As for expanding, Eric must be right about the moeglichkeit of at least one nearby Gartenbahnverein. Failing that, you might just have to chisel a phoney airduct hole from your small room out to the big, bad outer world and when no one is looking move aside the non-functioning air duct cover and hurriedly lay your track out into the back yard. Your neighbours will be enthralled and will no doubt enjoin you to leave it in place and build more and more! The market is and will probably always be profit driven, wonder how many people complain about lack of local train/hobby stores and of which were more than likely the same ones that went in looked, held and felt the product and then went home an purchased it on line for 10% cheaper. It's called money, but there are still great deals out there. When I started in G scale there were no American prototypes and it was necessary to build your own or kit bash from available parts, slowly the market responded. Sadly Marklin doesn't seemed to be too interested in the American style market, it will be there loss, USA trains is making beautiful products along with Hartland Locomotive works. It seems to me the newer generation seems to be more into the bigger 20+ train cars running round and around, but I believe the smaller size trains, meaning length, will always be popular allowing shunting and delivery of goods making it possible to have nice railways in small spaces. Want to see good looking trains, visit forums on G scale central, there is a lot of British and European stuff there and most are small goods wagons, little mac diesels live steam. Want a deal? Bachmann is selling there 4-6-0 metal drive train system @ $45.00 and with a little styrene, pvc pipe only knows what kind on engine one can build for under $100. 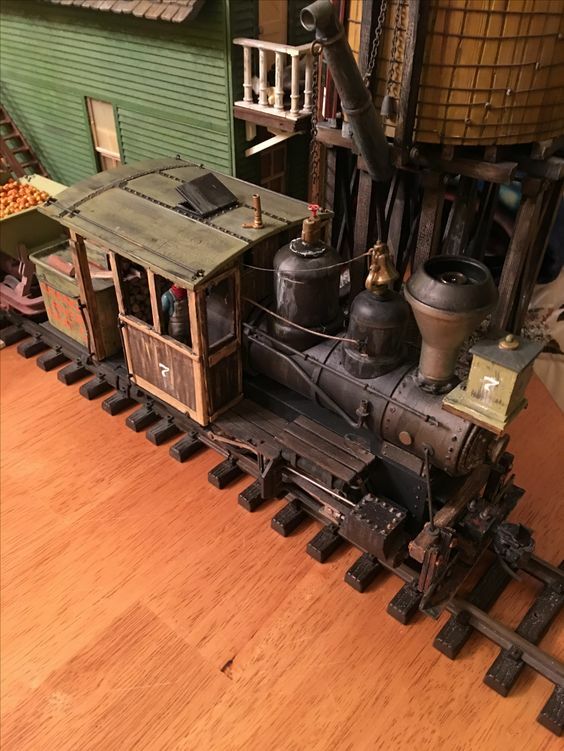 I will post in a separate message the history of Delton and aristo-craft trains with Phil Jensen, a pioneer in the hobby of G scale, and Phil still works at Hartland in the parts dept. on Tuesdays and Thursdays and is quite a individual and very interesting to speak with. This story will shed so light on the workings of the hobby from the manufacturing side and what drives the market. Wait long enough and someone will make it. Time for one of your Stainz-to-Forney conversion pictures to prove your point! I don't plan to run off my big Texas mouth but will make a few short comments just to keep things interesting. Indeed, Nuremberg WAS the home of LGB. Now owned by Märklin, I have little interest in the models they produce. I still have my heart set on gettin' a Hartland Mighty Mack switcher. If Miss Hall (Bobbye Hall of Hall's Hobby House fame in Dallas, Texas), were still with us, she'd call the little critter "CUTE"! Tis the Christmas season with all the German "goodies" a man or woman can stuff their guts with, however, I'm an SD2. No, not a rebuilt EMD, but you see, I'm "equipped" with Sugar Dibetes Type II. I do my best to avoid the candy and cookies at the grocery store this time of year when I go shopping. 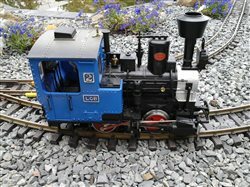 I believe the problem at Bachmann and their lack of interest in producing Fn3, even their traditional G scale trains, is the result of loosing Lee Riley, who passed away a few years ago. Lee was the man who not only had a lot of authority at Bachmann but also believed in promoting large scale as well as On3O. I still miss him very much. He and I would do lunch every year when I used to attend the annual international toy fair held in Nuremberg. A garden railway club might be OK for most folks, but after spending my last 21 years employed with Deutsche Bahn as a service rep at the Nuremberg station, I shy away from people for the most part. I hate crowds, so tend to stay close to home base during all of the holiday shopping madness. It especially gets bad this close to Christmas. I might consider building an outdoor railway next year. I have great neighbors who reside in this apartment house with my wife and I so let me give this some thought. Happy Holidays to y'all from a Dallas born Texan, Derailed in Deutschland! This is sort of depressing (not the age thing which I, for one, ignore unless I want to get out of a chair or remember anything) but, as I have lamented before, it is the lack of affordable product. I suspect until one of us wins the lottery (and remembers to share the winnings with us all to build a suite of K-27s) we are into kitbashing Big Haulers into pretend C-19s or some generic. Not only that, but while I can make pipes galore, file and weather plastic until it looks more or less like dirty or neglected metal from several feet away, I am afraid I have no idea where to get a plastic air cylinder, for example, without cannabalising another Big Hauler. Indeed, living, no, I stand corrected, surviving on a fixed income can create much frustration, especially when you constantly find yourself dreaming about that one model you just gotta get but then, all of a sudden, WHAM-O!, you suddenly wake up in the middle of reality once more. Believe me, I'm no exception. I enjoy "window shopping" all the large scale web sites but I have learned to "TRAIN" myself to refrain from placing orders, knowing that I can't afford that special locomotive, car, or caboose, I've wanted so bad, so long. I'm lucky to win just enough on the Saturday or Wednesday lottery drawing to play next week's game! So I continue to window shop the large scale web sites and be thankful that I still have my health as 2019 begins. I am preparing to sell off part of my railroad book collection to a dealer in Nuremberg, Germany, which should provide me with some capitol to invest in a couple more models of LGB's D&RGW "Silverton" passenger cars to go with the combine I picked up this past summer. Slowly but surely, I'll complete the train, then comes the task of finding the locomotive in which to pull it with. The Good Lord willing, I will pass "Milepost 73" this July, and all the time leading up to my birthday I will keep in mind the onetime slogan that graced the cover of Model Railroader magazine for many years, "Model Railroading is Fun!" Try the folks at www.lightrailproducts.com They might be able to help you or refer you to the source where you can find large scale plastic air cylnders and other useful parts you require. There are bound to be "junker" Big Haulers available for sale that have been retired which can be obtained for a nice price and when disassembled will fill up your parts bin for future use. You might try Phil Dippel for informaton where you can obtain large scale parts. Visit www.philsnarrowgauge.com Though his kits are out of production, his site is well worth a look see just the same. Castor: It appears that several Kalmbach blog sites still are encountering problems. My last post here at Garden Railways still hasn't appeared here in response to your question regarding parts. Check out Light Rail Products. Though they specialize in model trolley kits and parts if they can't help you perhaps they can refer you to another outfit who has the part(s) you require thus you can save the other Big Hauler to operate instead of "cannonballizing" the poor locomotive! Castor: For reasons unknown, my messages are not currently being posted here on the GR blog site. Will try again. You should be able to find an "abuse" Big Hauler that you can strip for parts w/o cannabalising a good runner. Dear Trinity, It seems they are coming through now and I will follow up your suggestions. I tried to ring a Mr Cody Grivno, who is billed as Kalmbach's Group Technical Editor, to gee him up re: ensuring this blog is working and new postings are emailed to participants but I failed to get through as they are closed 'due to inclement weather'! Nevertheless, it seems we are re-railed, so to speak, and thank you for the emails to date. Castor: Yes, it looks like the Garden Railways team has returned after being thawed out due to the recent adverse weather conditions in town. I just boarded the Subscription Train again after having been absent for a few years. Great bunch of people, they are, who just happen to run the best large scale magazine to be found on the market today! In the event you find an abused Big Hauler and strip it for parts, I imigine you've considered adding a scene (space provided of course) where the poor old locomotive is being cut up by the shop crew? If you do, be sure and submit the pix to GR for publication! Shucks, why not write a story to go with the photos?